Nike is transforming the store of the future with its revolutionary Nike App that allows consumers to make purchases instantly. Retail giant Nike is trailblazing tech in the retail space, transforming the in-store consumer experience with an app allowing consumers to fast-track different processes from purchases to trying items on in-store. 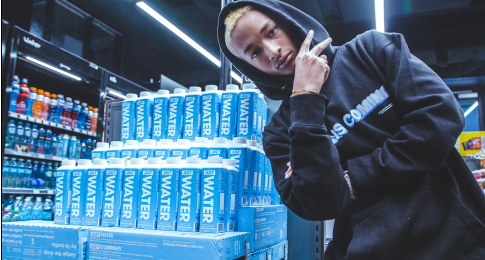 The app, which has been showcased in the New York store, which is dubbed “House of Innovation 000,” is set to expand to other stores later this year. The Nike App allows shoppers to try on shoes without talking to any staff and to purchase items instantly and walk out with them using Nike Scan. Nike’s New York store is leading the way in innovation. Shoppers scan product barcodes using their phone’s camera to makes purchases, find store inventory and even reserve products. The app transforms the shopper experience, giving customers the ability to short-circuit the checkout process and save time. 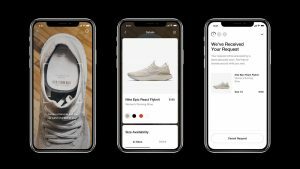 Nike hopes that the find and reserve feature will also save increasingly time-poor shoppers from wasting time on the phone or online, and instead able to see the whereabouts of products at the palm of their hand. The technology will roll out at all of Nike’s US stores and some European stores in the near future, with the retailer’s newest stores already getting ready for the transformation with the installation of smaller checkout kiosks. The Nike App is revolutionising the in-store experience. The app also rewards brand loyalty, with the Member Locks feature of the app allowing members the ability to access exclusive deals. 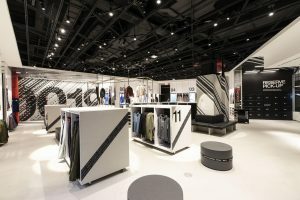 Users can also use a Shop the Look feature, which enables them to scan barcodes on mannequins to scroll through products worn by the display mannequin – and even order for them to be sent through to a change room for them to try on. The news marks another win for the retailer, who for years has been leading the way in the sector with in-store technologies that transform the customer journey.